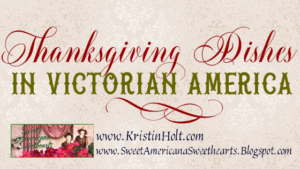 I’ve shared several articles about Thanksgivings in America’s Victorian era. 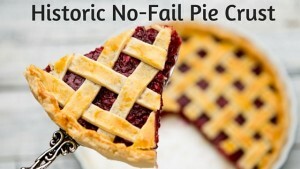 Topics covered include Victorian Thanksgiving day football games, tidbits for historians, how to carve the turkey properly, menus from those later 19th century decades, vintage pie recipes, no-fail Victorian pie crust recipe, and recipes for Thanksgiving dishes. 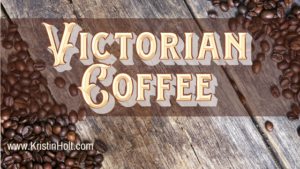 Today’s article in full comes from the El Dorado Daily Republican from El Dorado, Kansas, published November 25, 1897. A HAPPY TIME WHEN FAMILY CIRCLES ARE REUNITED. 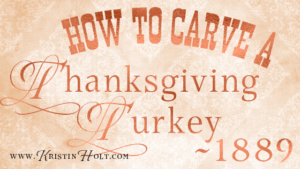 An Occasion When the Turkey Outshines the Eagle — Date of the Festival Chosen In 1782 — Fitting Souvenirs and Games. Seasonable Decorations. 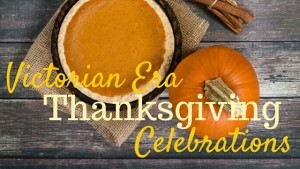 There is no law saying that Thanksgiving shall be observed, nor is there need of any, for the law of custom has decided the matter, and the president issues each year a Thanksgiving proclamation setting aside a certain day in the latter part of November for the general celebration. 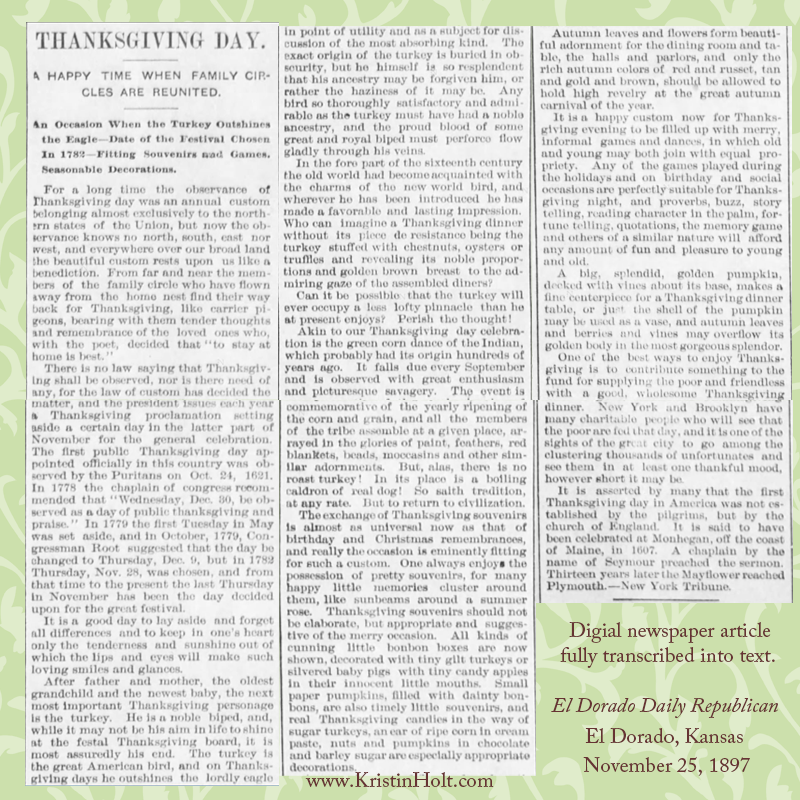 The first public Thanksgiving day appointed officially in this country was observed by the Puritans on Oct. 24, 1621. In 1778 the chaplain of congress recommended that “Wednesday, Dec. 30, be observed as a day of public thanksgiving and praise.” In 1779 the first Tuesday in May was set aside, and in October, 1779, Congressman Root suggested that the day be changed to Thursday, Dec. 9, but in 1782 Thursday, Nov. 28, was chosen, and from that time to the present the last Thursday in November has been the day decided upon for the great festival. It is a good day to lay aside and forget all differences and to keep in one’s heart only the tenderness and sunshine out of which the lips and eyes will make such loving smiles and glances. After father and mother, the oldest grandchild and the newest baby, the next most important Thanksgiving personage is the turkey. He is a noble biped, and, while it may not be his aim in life to shine at the festal Thanksgiving board, it is most assuredly his end. The turkey is the great American bird, and on Thanksgiving days he outshines the lordly eagle in point of utility and as a subject for discussion of the most absorbing kind. The exact origin of the turkey is buried in obscurity, but he himself is so resplendent that his ancestry may be forgiven him, or rather the haziness of it may be. Any bird so thoroughly satisfactory and admirable as the turkey must have had a noble ancestry, and the proud blood of some great and royal biped must perforce flow gladly through his veins. In the fore part of the sixteenth century the old world had become acquainted with the charms of the new world bird, and wherever he has been introduced he has made a favorable and lasting impression. Who can imagine a Thanksgiving dinner without its piece de resistance being the turkey stuffed with chestnuts, oysters or truffles and revealing its noble proportions and golden brown breast to the admiring gaze of the assembled diners? Can it be possible that the turkey will every occupy a less lofty pinnacle than he at present enjoys? Perish the thought! Akin to our Thanksgiving day celebration is the green corn dance of the Indian, which probably had its origin hundreds of years ago. It falls due every September and is observed with great enthusiasm and picturesque savagery. The event is commemorative of the yearly ripening of the corn and grain, and all the members of the tribe assemble at a given place, arrayed in the glories of paint, feathers, red blankets, beads, moccasins and other similar adornments. But, alas, there is no roast turkey! In its place is a boiling caldron of real dog! So saith tradition, at any rate. But to return to civilization. 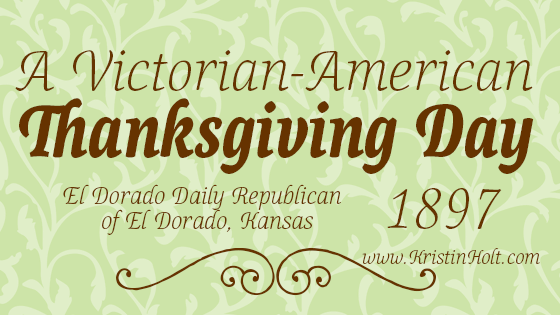 The exchange of Thanksgiving souvenirs is almost as universal now as that of birthday and Christmas remembrances, and really the occasion is eminently fitting for such a custom. One always enjoys the possession of pretty souvenirs, for many happy little memories cluster around them, like sunbeams around a summer rose. Thanksgiving souvenirs should not be elaborate, but appropriate and suggestive of the merry occasion. All kinds of cunning little bonbon boxes are now shown, decorated with tiny gilt turkeys or silvered baby pigs with tiny candy apples in their innocent little mouths. Small paper pumpkins, filled with dainty bonbons, are also timely little souvenirs, and real Thanksgiving candies in the way of sugar turkeys, an ear of ripe corn in cream paste, nuts and pumpkins in chocolate and barley sugar are especially appropriate decorations. Autumn leaves and flowers form beautiful adornment for the dining room and the table, the halls and parlors, and only the rich autumn colors of red and russet, tan and gold and brown, should be allowed to hold high revelry at the great autumn carnival of the year. It is a happy custom now for Thanksgiving evening to be filled up with merry, informal games and dances, in which old and young may both join with equal propriety. Any of the games played during the holidays and on birthday and social occasions are perfectly suitable for Thanksgiving night, and proverbs, buzz, story telling, reading character in the palm, fortune telling, quotations, the memory game and others of a similar nature will afford any amount of fun and pleasure to young and old. A big, splendid, golden pumpkin, decked with vines about its base, makes a fine centerpiece for a Thanksgiving dinner table, or just the shell of the pumpkin may be used as a vase, and autumn leaves and berries and vines may overflow its golden body in the most gorgeous splendor. One of the best ways to enjoy Thanksgiving is to contribute something to the fund for supplying the poor and friendless with a good, wholesome Thanksgiving dinner. New York and Brooklyn have many charitable people who will see that the poor are fed that day, and it is one of the sights of the great city to go among the clustering thousands of unfortunates and see them in at least one thankful mood, however short it may be. It is asserted by many that the first Thanksgiving day in America was not established by the pilgrims, but by the church of England. 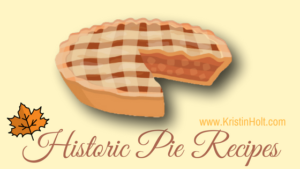 It is said to have been celebrated at Monhegan, off the cost of Maine, in 1607. A chaplain by the name of Seymour preached the sermon. Thirteen years later the Mayflower reached Plymouth. –New York Tribune. 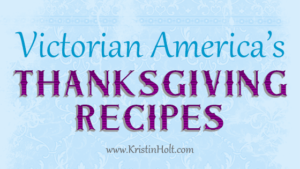 Are you interested in more details of Thanksgiving in the United States in the nineteenth century?